Irish Prime Minister Enda Kenny has brushed off threats from the Catholic Church regarding the country’s plans for abortion reform. Politicians who support the upcoming legislation have been threatened with excommunication. The proposed bill would legalise abortion in situations when the pregnant woman’s life was in danger. Legislators stress the bill clarifies rather than changes the rules regarding termination in Ireland. Abortion is constitutionally banned in the Republic, but a Supreme Court decision in 1992 found that termination should be allowed when a woman’s life is at risk. The current lack of clarity means that many hospitals are unwilling to terminate, unless there is a very obvious risk of death. The Church has deemed that the changes would ‘make the direct and intentional killing of unborn children lawful in Ireland.’ Cardinal Shane Brady reportedly made the excommunication ‘threat’. 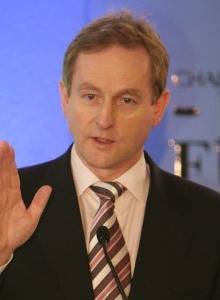 Prime Minister Kenny rejected the criticism, saying it was his duty to end legal confusion on the matter. At least one woman died in Ireland last year from being refused an abortion. Savita Halappanavar was miscarrying in hospital for three days before her death, with medical staff refusing repeated requests to terminate the pregnancy. Only after the foetus had died did doctors surgically remove the remains. Halappanavar’s organs shut down, and she died the next day. According to the Huffington Post, around 4000 Irish women travel to England each year for abortions. This entry was posted in Health, News and tagged abortion, abortion laws, health, in brief, ireland, womens rights. Bookmark the permalink.